Hurst, John Fletcher. 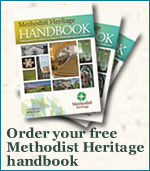 The History of Methodism ... World wide Methodism. Moister, William. Heralds of Salvation; Being Brief Memorial Sketches of Wesleyan Missionaries who have Died in the Work since the Commencement of the Enterprise. London: Wesleyan Conference Office, 1878, , 316pp. Kirsop, Joseph . Life of Robert Moss Ormerod, Missionary to East Africa. London: Andrew Crombie, 1901, viii,144pp.